Dismissing a burger for a diet? Consider these scenarios first. Some sorry souls out there are attempting this thing called a “diet.” So we’re not too sure what this elusive word means, but our Billings restaurant has deduced that it involves depriving the body of thick, juicy, burgers. When they come into Montana Jacks, they avoid our delectable burger selection at all costs, and we simply don’t understand why. Burgers are the epitome of deliciousness, and we want to alleviate the pressure people feel to not consume a burger. 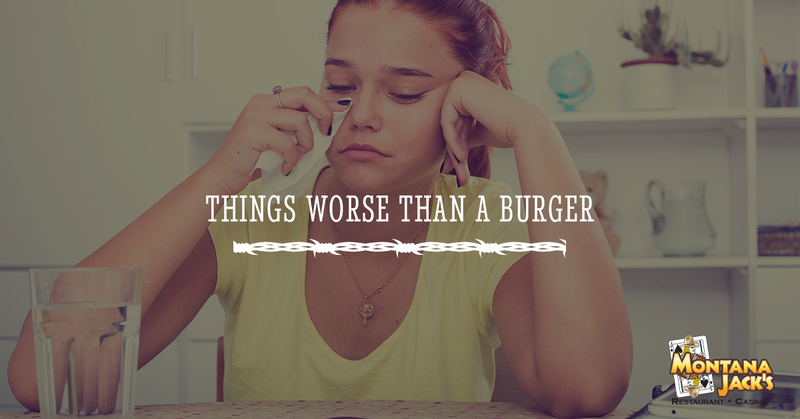 Here are just a few things that are worse than eating one of the best meals available. Consider these and then get back to us. Sure, this is just a saying, but seriously? What’s as bad as taking a piece of candy from a human who looks at candy as if it’s promising them an early retirement? If you had to choose between stealing candy from a poor, poor baby and eating a yummy burger, you’d surely choose the burger right? At this point, it’s diet versus sad baby. You’re watching your favorite sitcom and BAM! That commercial comes on. What do you do? Change the channel? “In the aaarms of an angel” is playing and you see them, those poor animals who have been mistreated and who need a home. Is eating one of the best burgers in the state of Montana really as bad as how you feel when you sit through Sarah McLaughlin serenading you with sadness? I think not. Sure, Happy Gilmore and the Wedding Singer humored us in the 90s; however, Sandler’s ability to make a crowd laugh washed away just as Y2K took a hold on the nation. I mean, come on. He should have stopped after “Click.” But alas, here we are being bombarded with films like “Zookeeper” and “Grown Ups 2” which we’re pretty sure got a negative rating on Rotten Tomatoes. The question stands: post-2000 Adam Sandler movie or a yummy burger? Can you do it without blowing up in anger? I mean seriously, the guy jacked up the price of an inexpensive, yet nonetheless important, drug up a solid 5000%. Oh, and he bought the only copy of Wu-Tang Clan’s album “Once Upon a Time in Shaolin.” Besides the fact that he’s currently in prison, would you rather sit through an entire DIET dinner with this monster or enjoy a yummy burger from Montana Jacks? As you can probably pick up, diets are evil and burgers are good. It’s that simple. If you chose “burger” as the answer to any of the above scenarios, then we think it’s time you come back into our Billings restaurant and order one of the best burgers in all of the land. After that, we give you permission to continue this diet nonsense in peace. For more information on Montana Jacks, feel free to give us a call! Thanks!